THE SHOWDOWN - ON YOUR MARKS, GET SET, DIE! Come hither, my friend. Come hither and garner your attention on a race through hell. But of course, this being hell, you can bet your bottom dollar this race won't involve your usual run of the mill competitor. As you might have guessed, these competitors are none other than the most horrid, the most horrific, and the most... errr... hairy competitors known to man. Russ, it's now over to you. 1) What are your own origins, Russ? Well in the beginning there was a big bang, POW!, and somewhere in the middle I was spawned, Ha! I started writing at an early age, mostly fiction, thanks to D&D. I was fascinated by their stories and artwork, and set out to write similar stories as a DM for the local kids. I soon learned I had a knack for writing and others wanted to hear my stories, so fast-forward to college, and its here where I really started working on fine-tuning my prose. 2) What inspired you to create, ‘The Showdown’? I read a lot of EC Comics growing up, and I appreciate they didn’t end on some moral high note, just the monster staring out at the reader and you’re like, oh, f*ck, that’s not going to be good! I also feel like lowbrow art and the underbelly of society isn't acknowledged enough in comics today. The Showdown addresses that. It’s not PC. The good guy doesn’t win. No Hollywood ending. No riding off into the sunset. I wanted to represent the bad guy for once. The Showdown was inspired by that, plus Dante’s Inferno of course. 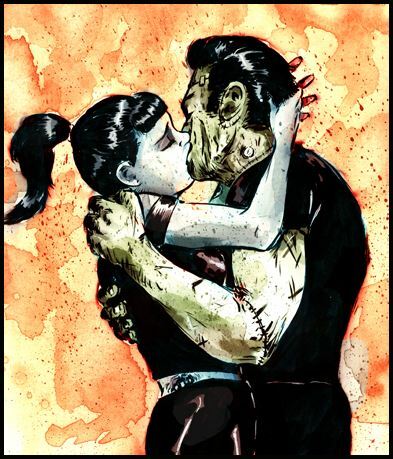 3) Can you briefly tell us what this horror comic is all about? On the surface, it’s a race through Dante’s nine circles of Hell. Imagine if you will, a world were infamous monsters such as vampires, werewolves, and zombies race through Dante’s Inferno in a death match called, “The Showdown”. The winner gets the chance to raise hell on earth once again. Its fantastic horror meets campy grindhouse. But underneath all that, it is a revenge piece at heart – against society’s hypocrisy and self-righteousness – like Dante Alighieri would have liked. 4) What song would you say best represents your book and why? The Showdown has a plethora of influences: from Punk, to Rockabilly, Oi, to Surf, but I would lean more towards a Psychobilly song by Hayride to Hell called, “Creature Feature”. That song, or that type of music in general, has a campy undertone, fifties-themed lyrics, and great visuals. When I write I always have my music blaring in the background (sorry neighbors). 5) If you could get a celebrity – either living or dead – to promote your wares, who would you choose, and why would you want to choose this particular person? First person that comes to mind would be a puppet, the Crypt Keeper. His introduction of horror stories always brought a smile to my face and he would do The Showdown justice. As for a living person, Elvira’s still got it, and there are two reasons why I would be honored if the Mistress of the Dark had a few choice words to say about the comic. 6) What have you learned about yourself through this endeavor? And were there any unforeseen obstacles you had to contend with along the way? 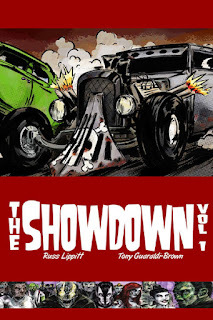 I started writing The Showdown in 2008, and the graphic novel was picked up by Broken Icon Comics and is being published in October, so I discovered I’m a pretty damn persistent person. I think I always knew that, but working on a project that took seven years to complete verifies that notion. My, or any other artist for that matter, major hurdle would be money. It doesn’t grow on trees, boys and girls, and unfortunately it takes a lot of it to compete in this industry. But I wouldn’t call that an obstacle, rather a speed bump. 7) During your time in this field, what is the one thing that has kept you in good stead? My experience and knowledge for sure. I’m not just a comic writer; I’m a writer period. I dwell in most mediums. I write short stories, scripts, both full feature and TV. I’ve written novels (currently working on two). I write songs for bands. I write for magazines and zines: columns, articles and reviews. I’ve been a part of writer’s groups for years. I guess I believe that practice makes perfect and I aim to be prolific. 8) If ‘The Showdown’ has a motto, what do you think it would be? Live fast and die hard. I actually have a similar tattoo I got when I was just a lad. The Showdown has a lot of my personality in it, like most of my stories, and that motto fits perfect, if I do say so myself. And on that great note, dear reader, I'd like to thank Russ for telling us about his graphic novel, The Showdown, before directing you towards his website, facebook, and twitter pages.